This week’s economic calendar is exceptionally light, with no true top-tier reports. Even the 2nd-tier data is limited with Philly Fed on Thursday and Existing Home Sales on Friday. That leaves all the more focus on what was always destined to be this week’s main event. Since the end of January, when bonds began making a case for a consolidation in the new, lower rate range, I’ve been harping on “mid-March” as the first real opportunity for a big break higher or lower in rates. The reasons for this were simple and twofold. First, the government shutdown cast uncertainty onto economic data at least through mid-March. Second: the Fed would be out with a scheduled policy announcement, press conference, and updated economic projections on March 20th. While the Fed has arguably been a bit flighty since December, they’ve also done a good job of convincing the market that they’re not really sure what to do at this point, and will be leaning heavily on the incoming economic data for cues. With that in mind, this meeting could actually be a bit early to expect any comfortable conclusions from the Fed, because we haven’t really seen a lopsided economic case in this month’s data. But the Fed has something else to talk about–something that both sides of the market (equity and debt) are very interested in. I’m talking about the announcement to phase out or completely stop the balance sheet runoff (the Fed’s policy of NOT reinvesting the money it receives on its bond portfolio. From a tradeflow standpoint, this is essentially another round of QE, because it will create 10s of billions of dollars of new purchase demand in the bond market immediately. That said, the Fed wouldn’t be printing new money–simply reinvesting the money it already has. Both sides of the market really can’t seem to wait for confirmation that this is happening soon. 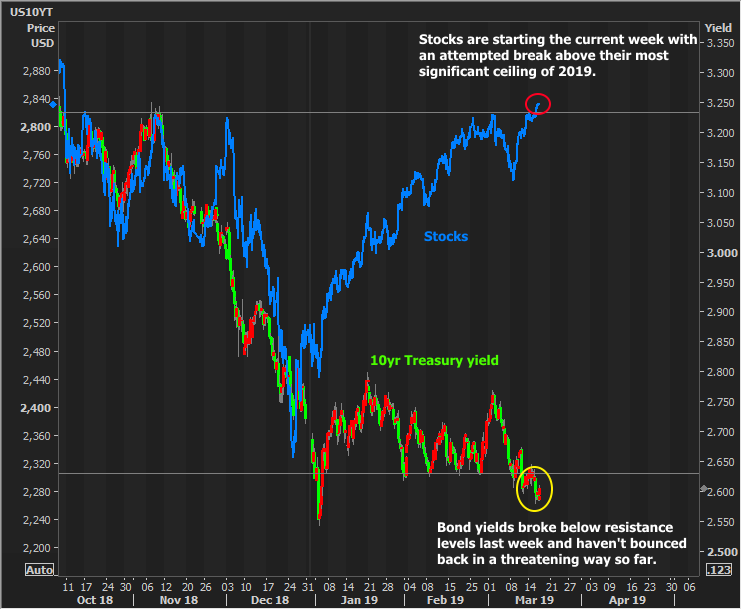 Bond yields broke below their key resistance level for the year last week, and stocks are going to take a stab at the same feat this morning. Worst case for markets: Fed alludes toward late-2019 as the more appropriate time frame and says they’ll be watching econ data in the meantime. If anything, I think markets are a bit too excited about what they think they’ll hear on Wednesday, but I hope I’m wrong. Previous articleClosed Ended or Open Ended Investments: What’s the Difference?